Reasoning is a game of wits and presence of mind! Yes, it is true and it might seem as the greatest of the challenge after English Section’s surprises but yet this one can easily be dealt with. You just need correct practice and hardwire your brain to quickly make decisions of what to attempt and what to leave. And for same we are providing you questions on Alpha-Numeric as per the 47 days study plan for RRB. 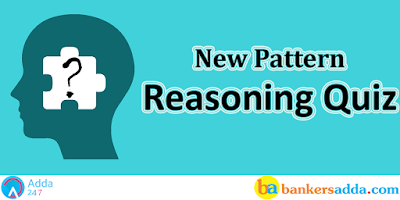 To Practice more with these new pattern Reasoning Question for RRB PO Exam 2017. Q1. Four of the following five are alike in a certain way based on their positions in the above arrangement and so form a group. Which is the one that does not belong to that group? Q2. How many such numbers are there in the above arrangement each of which is immediately preceded by a symbol and immediately followed by a vowel? Q3. Which of the following element is the fifth to the right of the eighteenth from the right end of the above arrangement? Q4. Which of the following is the fourth to the right of the eight from the left end of the above arrangement? Q5. If all the symbols are dropped from the above arrangement, which of the following will be the ninth to the left of M? Directions (6-10): These questions are based on the following set of numbers. Q6. If ‘1’ is added to all even digits in all the numbers, in which of the following numbers will the difference between the first and second digit be less than two ? Q7. If in each number all the digits are arranged in ascending order within the number, then what will be the difference between lowest and highest number thus formed? Q8. If all the numbers are arranged in descending order, then what will be the difference between the second digit of highest number and third digit of second highest number? Q9. If in each number first digit is replaced by the second digit, second digit is replaced by the third digit and third digit is replaced by the first digit, then which number will be the second lowest? Q10. If in each number, the first and the third digits are interchanged, and then which number will be the highest? (i) If the first digit is even and last digit is odd, both are to be coded by the code for the last digit. (ii) If the first digit is odd and last digit is even, the codes for the first and the last digits are to be interchanged. (iii) If the first as well as the last digit is odd, both are to be coded as S.
(iv) If the first as well as the last digit is even, both are to be coded by the code for first digit. Q14. If each consonant in the word “ELEPHANT” is changed to the previous letter in the English alphabetical series and each vowel is changed to the next letter in the English alphabetical series, and then the alphabets so formed are arranged in an alphabetical order from left to right, which will be the third from the right? Q15. How many such pairs of letters are there in the word MODERN, each of which has as many letters between them in the word (in both forward and backward directions) as they have between them in the English alphabetical series?